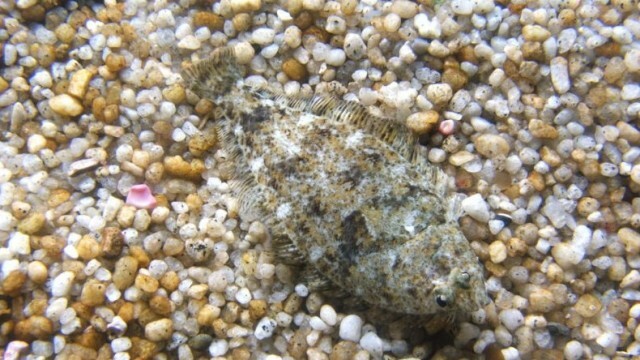 Sand provides habitat for bottom fish such as the sand dab hiding in this photo. Photo by Tewy / Wikimedia Commons. The longest beach on San Francisco Bay is about to get a long-needed infusion of sand -- 82,600 cubic yards of it, to be exact. That's enough sand to fill dump trucks that would stretch end-to-end for 10 miles from Alameda across the bay into San Francisco. Engineered and completed in 1987, the 2-1/2 mile-long Crown Memorial State Beach in Alameda attracts thousands of visitors in summertime and nearly as many shorebirds in winter. Alameda has been a popular seaside destination since the late 1800s when Neptune Beach and other amusement parks operated along the shoreline, attracting San Franciscans to the relatively sunnier contra costa (or "opposite coast") across the bay. The beach helps protect homes and businesses along the shore with a recreation-friendly substrate, which is much more attractive than rip-rap or a seawall. It also provides resting habitat for overwintering shorebirds. The beach began noticeably eroding from the 1960s and, prior to the engineering project, put Alameda’s Shoreline Drive at risk. Streetlights were overhanging the bay and the road was being undermined by the power of the tides until a clever engineering project was undertaken. A series of dunes was designed to slow and capture windblown sand, and at both ends of the beach, sand catchments and a concrete wall, called a groin, helped keep sand from being swept out to the bay. Maintenance crews from the East Bay Regional Parks move the sand from the catchments back to the central nodal point at Shoreline and Constitution Way. There’s an expected loss of approximately 1% of sand per year, according to the engineered beach model. Data shows that this has matched expectations, except for heavy storm years in 1995 and 2006-7 when much more sand was lost. This 3-D map shows the sandy shoals off Angel Island. Bedrock knobs are noted with red dots. Image courtesy of USGS. The replacement sand will come from the San Francisco Bay. Point Knox Shoal, just south of Angel Island, has sand extraction plots managed by the San Francisco Bay Conservation and Development Commission and other state agencies. The sand is mined for construction materials such as concrete and asphalt, as well as restoration projects like at Crown Beach. There’s a fascinating document from United States Geographic Survey (USGS), “Shifting Shoals and Shattered Rocks – How Man Has Transformed the Floor of West-Central San Francisco Bay,” describing the bay’s bathymetry and geology -- from the sandy shoals to bedrock knobs -- and how it’s been altered over time. The knobs have mostly been blasted away, but a few remain below the surface such as Blossom Rock and Arch Rock. The sandy shoals aren’t well-known and speculation arises as to their origin. Were rocks carried down the watershed and ground up on their way from the Sierra and the Delta, or was sand swept in from the Pacific Coast on incoming tides? Even the quantity available for extraction is unknown, according to the report, as well as whether the amount of sand in the shoals is stable, replenished or depleted. You can read more about the Crown Beach project on the East Bay Regional Parks website. It’s scheduled to get underway in September and finish in December. And they won't be using dump trucks; the sand will be barged in directly from the sandy shoals off of Angel Island and pumped ashore.